PCMechanic Computer Repair in Davenport, FL offers computer virus removal service to rid your computer from viruses, adware, spyware, and other malicious threats. I use multiple scanners to make sure that your computer is free from virus or malware infections. If your computer or laptop is infected by a virus, pop-ups are appearing from nowhere, or browser redirecting you to another website, then this service is for you. Computer Virus Removal Service is guaranteed to purge your computer system from nasty viruses, adware, and spyware infections. My computer Virus Removal Service uses the latest technology to remove viruses and infections from your PC. I use multiple scanners, with different scanning characteristics, which will give you the best results. The virus removal process has to be thorough and comprehensive. It has to cover every aspect of the Windows operating system. With that being said, I have had great success with my computer virus removal service by following a set of virus removal protocols. The success of any computer virus removal service is dependent on customer satisfaction. Customers who have used my virus removal service are extremely happy to get back a clean computer. A virus is an executable program that can reproduce itself and spread from one computer to another via a network or the Internet. This means that the virus multiplies on a computer by making copies of itself. This replication is intentional and it is part of the virus programming code. A virus can also be transported on a removable medium such as a CD/DVD or USB drive. Depending on the nature of a virus, it can cause damage to your hard drive contents and/or execute unwanted/unauthorized functions. The term “virus” is often, but incorrectly, used to refer to other types of malware such as, but not limited to, adware and spyware. These programs do not have the ability to replicate themselves. Malware, which stands for Malicious Software, includes computer viruses, computer worms, Trojan horses, most rootkits, spyware, dishonest adware, and other malicious or unwanted software. It is critical that you have an active and updated antivirus program installed on your computer. For more protection against spyware and malware, I recommend Superantispyware and Malwarebytes to compliment your anti-virus software. 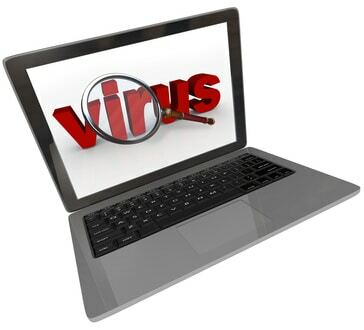 Certain types of viruses are very destructive and can wipe out irreplaceable data. For this reason, I recommend to back up your data before a computer virus removal service can begin. Have an updated and active anti-virus scanner running in the background. I recommend Kaspersky Internet Security. Have two (free) on demand scanners. One for malware and another one for spyware. Run them regularly. Inspect and make sure you are getting Windows updates. Malware will corrupt the Windows Update Service and leave your operating system vulnerable. The greatest threat to a computer’s security is free software downloaded from the internet. Be very critical of what you download. Run it by virustotal.com before installing. Do a custom installation instead and uncheck additional software. Create a restore point before installing any software. This has saved me countless times. Malware will also delete restore points and corrupt the service. Back up your data. Western Digital external storage devices include backup software for free. The last time my computer crashed I was able to get everything restored thanks to WD’s software. Do not click on any link that pops up on the internet that demands you to take immediate action to fix your computer. Before you click on any link, first hover over it and see the URL is pointing to. You can use virustotal.com to scan a web page for security. Do not click on any link in your email if you don’t know the source it’s from. Remove adware from your browser by using AdwCleaner. A great tool to remove unwanted toolbars, search bars, pop-ups, and banners. Create user accounts for your children and guests as standard accounts. This will limit the amount of damage done to that account. There you have it. These ten tips that can lessen the chance of infection. If your computer is infected with a virus, don’t delay. Give me a call today.